In each episode of Treks in a Wild World, Pilot Productions’ intrepid trekkers travel to far-flung regions where they embark on incredible journeys combining ecology, anthropology and history with action sports and outdoor pursuits. 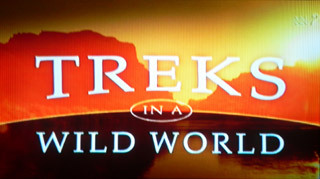 Treks in a Wild World is a show for intrepid adventurers and outdoor lovers which ran for three series. Combining ecology, anthropology and history with action sports and outdoor pursuits in beautiful and sometimes remote locations. Presenters Cristina LaMonica, Holly Morris, Bradley Cooper, Steve Dunn, Estelle Bingham and Zay Harding went Biking, Hiking, Cattle Driving, Climbing, Whitewater Rafting, Wreck Diving, Poling, Bushwhacking, Diving and Sailing in such locations as the Rio Grande, Alaska, Borneo, Kenya, Papua, Niger and Peru amongst many other countries. Treks in a Wild World is broadcast in Australia every now and then on ABC TV1 or it’s other digital TV channels available Free to Air and via Pay TV Cable and Satellite.